Living rooms are made for relaxing and entertaining and Lozi’s media units are perfect centrepieces for the most social room of the house. Each media unit is completely made-to-measure and full of unique design features adapted to each client’s lifestyle. Svett came to Lozi looking for a large bookshelf, media unit and storage unit all rolled into one for his living room. There was one catch - he wanted it to be modular so it could adapt to any future homes he may live in, and not made specifically to fit this one space. Lozi created this floor to ceiling design based around our original modular storage design. We adapted this design into 13 separate units of varying size and shape, stacked on top of one another. This allows Svett to change and adapt the layout of his bookshelf as well as split it into several smaller pieces should he require. The curved corner details break up the layout and several doors hide the less attractive items. A wonderfully multi-facetted project, Gavin wanted to completely renovate his living room, with a large media unit and bookshelf as well as a folding desk nestled under the stairs. The large birch plywood media unit has ample easily accessible drawers for all his children's toys and neatly hides away any unsightly media equipment. The plasma screen may be at the centre of the design, but a colourful ombre of colour on the drawers and a nook seat for the kids mean it doesn't become the focus point of the whole room. Lozi created this clean and bright media unit for tech savvy Patrick, who wanted to neaten up his living room and keep all his computer equipment tidied away. A long birch set of cupboards were tailor made for all his equipment. Aeration vents beneath the Plasma screen stop items from overheating and discreet holes are carefully placed by the wall to keep wires tidy. Off-set open plan white laminate shelving with oak dowel legs allow Patrick to display his cocktail making equipment, computer games and collection of books. Fun yet practical, Alex wanted a media unit that reflected his taste whilst also being perfectly adapted to their space. Taking into consideration design requirements like the plasma screen and adding ample covered storage, this unit is given an update with bright and fun colours, which appealed to Alex and his young toddler alike. A neat and simple design, George wanted some extra room in his flat that could also double as seating when needed. Thanks to two extra seats, with bespoke wool cushions, George can entertain more easily. 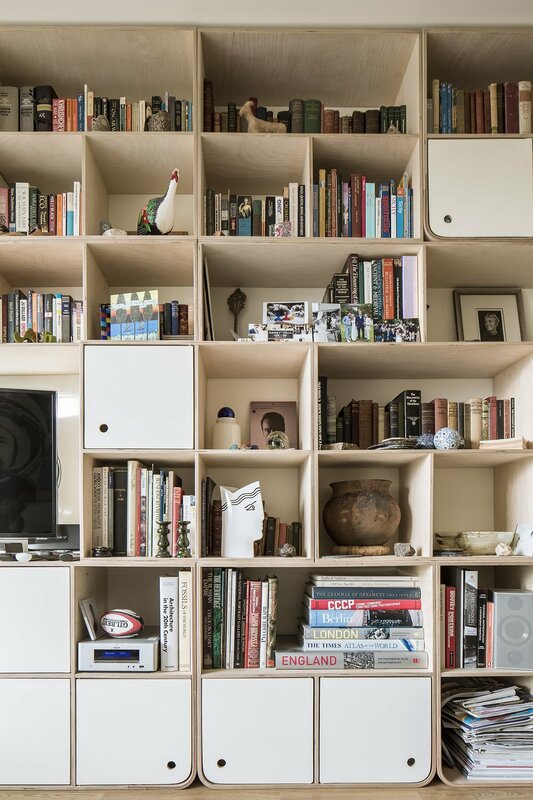 Birch plywood open plan shelving create plenty of rooms for books and decorative items, and a large space can accommodate a plasma screen. At the bottom, four cupboards designed to hide away media equipment are finished in maple veneer with bespoke long plywood handles. The entire lower part of the unit is finished in a beautiful plastic surface, made from recycled yogurt pots. A summary of our order process can be seen in the graph below. A detailed breakdown of each step can be found on the Design Process page of our website. After you have agreed a quote, we will supply you with a 3D computer assisted drawing of our design to help you visualise the final outcome.